Goat anti Lactococcus lacti PGMB. Conjugates available. Please ask for details. ELISA: 1/1,000-1/5,000 dilution suggested to begin optimization. This product has been assayed against 1.0 µg of beta-phosphoglucomutase [Lactococcus lacti] in a standard Sandwich ELISA using peroxidase conjugated affinity purified anti-goat IgG [H&L] (Rabbit) and ABTS as a substrate for 30 minutes at room temperature. A working dilution of 1/15,000 to 1/60,000 of the reconstitution concentration is suggested. Restore with 0.1 ml of deionized water (or equivalent). 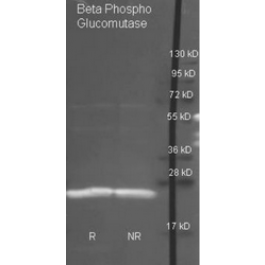 This antibody detects beta-phosphoglucomutase from Lactococcus lacti. Immunoelectrophoresis gives a single precipitin arc against anti-Goat serum as well as purified and partially purified beta-phosphoglucomutase [Lactococcus lacti]. Cross reactivity against b-Phosphoglucomutase from other sources is unknown.